The role of a Physiotherapist is to assess, diagnose and treat neuromusculoskeletal injuries. Physiotherapy Edinburgh: combines manual therapy with postural correction, exercise therapy, education and advice in order to provide the best possible prevention and recovery from injuries, disabilities, imbalances and neuromusculoskeletal issues. Neuro: meaning nerves and nervous system, musculo: meaning muscles and tendons and skeletal: meaning bones, joints, cartilage and ligaments. Physiotherapists have extensive knowledge in anatomy, physiology, pathology and are experts in pain, movement and the functioning of the body. Physiotherapists work with you to help overcome any movement disorders you currently have to restore normal, symmetrical, pain-free movement – whether it resulted from an accident/illness, ageing, lifestyle or from birth. Our Edinburgh Physiotherapists are caring, passionate, understanding and really want to help improve your well being. Our Physiotherapist’s are members of both HCPC (Health and Care Professions Council) and CSP (Chartered Society of Physiotherapy). What is Involved with Physiotherapy Edinburgh? The first step will involve an initial consultation including history taking, medical history, an in-depth assessment (best to wear shorts and a vest top for this or comfortable sports wear as movement, muscle strength, joint stability, nerve mobility etc may be tested), clinical diagnosis, followed by the necessary treatment plan required to treat the ailment. Treatment may begin in this session. Physiotherapy aims to restore maximum functioning by reducing pain and stiffness, correcting any bio mechanical issues allowing you to return to optimum functioning as quickly as possible. It is very rare we see a client in which we need to refer to a different medical profession however if needed we do so. We refer to GP and A&E if we suspect a fracture, infection or anything which would require further investigation. In these cases an assessment will still be carried out but may not continue on to any treatment and include advice on what to do next. The initial assessment session for Physiotherapy is 45 mins and any future follow up sessions will be 30 or 60 minutes dependent on how long the Physiotherapist would recommend. A multi-disciplinary and holistic approach to your health will ensure we can get to the bottom of your issues and provide you with the best care possible. The benefit of having both Physiotherapy and Sports Massage under one roof, is our therapists can refer if needed and we will make sure you get the treatment you need. Click here to read some of our Physiotherapy Testimonials or here to read a case study on one of our clients. 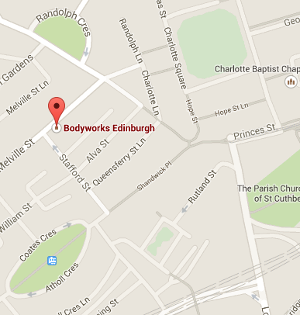 If you would like a Physiotherapy Appointment you can quickly book online, or give us a call on 0131 241 1833 or email on info@bodyworksedinburgh.com. If you have private health care insurance you may be entitled to claim back the cost of your treatment. Each individual insurance policy will cover different treatments, so check with your insurance provider to see which treatments are covered and what requirements they specify. Your health insurance company may require a GP referral in order to cover the cost of your treatment at Bodyworks so just check this also. Below are some examples of providers that cover Physiotherapy but always check your individual policy first and find out how to claim back the cost.